A 5-year-old boy who found a gun in his home appears to have accidentally shot and killed himself, a source within the Riverside County Sheriff's Department said Wednesday on the condition of anonymity. The incident happened at 5:21 p.m. Tuesday in the 31000 block of Wolfskill Avenue in the rural Nuevo area of Riverside County, officials said. "In this area, when something like this happens, it impacts the entire community," one Nuevo resident said of the tight-knit area. Investigators are revealing new information as to what may have led to a 5-year-old's accidental shooting death, and they're now looking into a possible marijuana grow in the backyard. Jacob Rascon reports for the NBC4 News at Noon Wednesday, March 5, 2014. Detectives and forensics investigators spent nearly a full 24 hours in rural Riverside County trying to determind whether any foul play or negligence was involved in his death. The boy's grandfather was in the home at the time of the shooting and was being questioned Wednesday afternoon, but a Riverside County sheriff's official told NBC4 Wednesday morning the boy appears to have accidentally shot himself in the home. 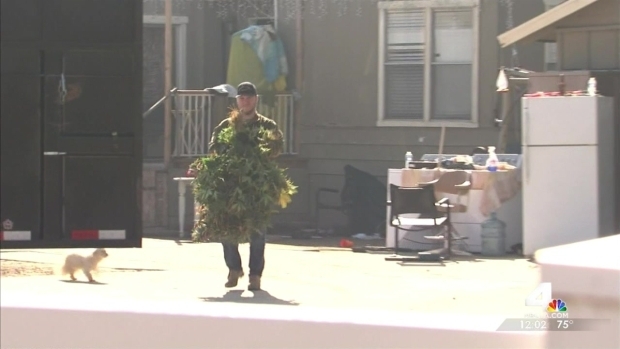 The home had nearly 200 marijuana plants growing in a backyard tent, but sheriff's officials had not yet said whether any arrests would be made in connection to the illegal grow. Neighbors, who asked to be named only as Laura, told NBC4 the family said their operation was legal and for medicinal purposes. "They would say they had a permit," Laura said. The 5-year-old boy apparently did not live at the home and was only visiting. The Nuview School District told NBC4 the victim did not attend school in the area. But other children did live in that home, according to neighbors. "How could they have guns knowing that they have kids, and you know, these kids get into everything," Laura said. A detective told NBC4 that a neighbor called 911 to report the incident. The 5-year-old was pronounced dead when investigators arrived at the scene.